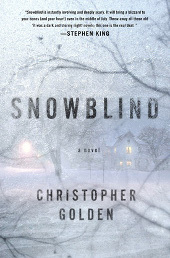 Note: Thanks to Simon & Schuster for providing an Advance Reading Copy of this title. The Troop tells the sorry tale of Scout Troop 52. While on a wilderness camp on remote Falstaff Island off Canada’s east coast an unexpected visitor lands in their midst. Bedraggled, starved almost beyond recognition and raving deliriously about insatiable hunger he’s an obvious danger to the small group of teens but Scoutmaster Tim, local GP, can’t just turn an obviously sick man away. He’ll soon wish he had though, as it transpires that he didn’t come alone. Nestling in his belly (and indeed the rest of his walking corpse) are a horde of visitors, all eager to find new hosts no matter what age or species. 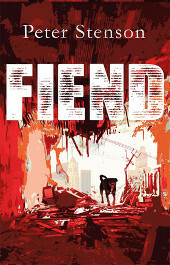 What ensues is a gruelling, visceral tale of survival and body horror. The boys – Ephraim, Newton, Max, Kent and Shelley – soon realise that they are stranded on the island. 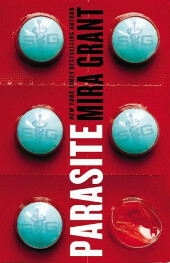 The sole adult is soon incapacitated by the parasites lurking in the gatecrasher’s internal cavities and they must do everything they can to avoid his fate. The insanity of the situation, combined with the natural group dynamic present in pubescent boys everywhere, means they are soon pitched against each other as much as the mysterious, repellent organisms sharing the island. And meanwhile, why is nobody coming to check on them and what are those black helicopters and boats circling the island at a distance? Early reviews of The Troop have compared it rather obviously to Lord Of The Flies and to be fair the comparison is entirely justified. But it’s so much more than that. Beside the whole kids-on-an-island trope there are elements from other equally powerful sources. The first which sprang to mind was John Carpenter’s The Thing. You’ve got a small group of people in an isolated environment threatened by a near-invisible, highly contagious and utterly deadly entity which threatens the whole of mankind. That and the buckets of gore, incredibly inventive and wonderfully sickening gore. The second was Battle Royale, mostly for its relentless brutality in its treatment of its adolescent cast. Nick Cutter is utterly merciless in creating an inescapable hell for his characters, playing a cruel god of fate and dashing their hopes on the rocks at every turn. So we’ve established that it’s a vicious gorefest mixed with a school holiday. But what of the writing itself? I’m pleased to say it’s certainly of a strong enough calibre to hold the story up. While The Troop initially had me wondering whether or not to continue – it felt a little juvenile purely because of the subject matter – it soon picked up the pace, got its grown-up clothes and started delivering gutpunch after gutpunch. Nick Cutter has two prominent strengths as a writer. 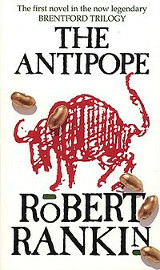 The first is characterisation, peopling his novel with a broad mix of characters ranging from sympathetic to repellent to outright evil. Despite their young ages these kids are all individuals, on the cusp of adulthood and starting their journey of self-discovery, each choosing distinctly different paths which sets them up for conflict later. Then, having introduced his cast, he introduces the second key tool in his kit as he begins gleefully dismembering them. This man has a talent for depravity, knowing exactly which buttons to push in order to tie your guts in knots. At times it was difficult to discern which was more disgusting, the parasites invading the bodies of the Scouts or the grotesque effect they had upon those very bodies and minds. 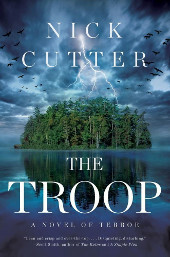 Cutter acknowledges a debt to Stephen King in the acknowledgments but it’s clear that The Troop is no mere knock-off. Yes it wears its inspirations on its sleeve but Cutter manages to take these distinct elements and create something entirely new and, to a seasoned horror veteran, remarkably stomach-churning. I almost hope he never sells the movie rights to this book, I don’t know if I could handle it and that is perhaps the highest praise I could offer anyone in this genre. For the longest time I had been of the opinion that zombie fiction was an entirely dead genre (sorry) only occasionally revived (really sorry) by the likes of World War Z, rare titles indeed. The majority of the titles found on the shelves are thoroughly braindead (forgive me) and do nothing but elicit moans (I know, I know) as I read. Thank Romero then that I stumbled upon Brian Keene via his Jack’s Magic Beans short story collection. 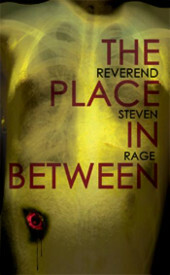 The originality, visceral thrills and creeping menace he managed to bring to the tales within (read them, seriously) tempted me to pick up his award-winning The Rising, paving the way for four or five nights of intense night reading. The Rising begins in a setting more familiar to zombies than the survivors of their apocalypses (Apocaloids? Apocalii?). Jim Thurmond is trapped within the shelter constructed in his backyard in the wake of millennial fever. Above his tomb roam the undead remnants of his neighbours, not to mention his wife, peering down his periscope and taunting him incessantly. Suddenly his cellphone rings after days of silence, a missed call and message from his son Danny at his ex-wife’s home halfway across the country in New Jersey. By the time he listens to the recording his battery dies, power stations having failed around the world, but the sound of his voice galvanises him to strike out and reach his son, saving him if it costs him his life. As you can imagine, the country lies in ruins. With no warning the dead began rising, armed with an insatiable hunger for human flesh and more besides – see later… Infrastructure collapsed, humanity shattered into tiny pockets of survivors, varying massively in their levels of sanity and civilisation – you know the drill. Jim has to pick his way through this wasteland, avoiding the dead and the more dangerous elements of the living, making alliances where he can and inching ever closer to Danny. By the second installment, City Of The Dead, Jim has reached his destination but finds himself drawn to the centre of Manhattan. Ramsey Tower, a supposedly impregnable and self-sufficient built in the wake of certain terrorist attacks, is putting on a lightshow every night, broadcasting to survivors in the locale. Following a hair-raising journey to the tower, Jim and his collection of stragglers (no spoilers as to who makes it!) join the tower’s community. Still shell-shocked from the devastation outside, the fortress is as close to paradise as they can imagine. Plentiful food and water, a functioning school, hospital cinema and broadcast system, enough armed guards to see off the interminable zombie assaults, it’s an island of plenty amid the hordes of the undead. But things are never so simple – with a zombie army en route to the tower and a leader slowly losing his grip on reality (in truly hilarious fashion) it’s only a matter of time before they are once more fighting for their lives. Now while the above synopsis may sound like a mish-mash of several well-worn zombie tropes, The Rising and City Of The Dead have an ace in the hole with the mechanics of the undead themselves. Remember I mentioned the taunting? That’s not figurative, that’s literally talking to Jim, looking down his periscope at him, feeding him his dead wife’s recollections of extra-marital affairs to drive him insane. The zombie army? Not merely your average shambling horde of corpses but a legion of the undead toting rifles and driving tanks. 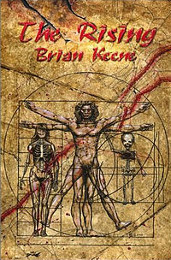 Where most other zombie novels either leave the origins of the scourge a mystery or go for the usual disease option, Brian Keene takes a novel approach which allows him far more flexibility. His dead bodies are possessed by demons, malevolent creatures shunned by God from the dawn of time and out for revenge against his pet creatures. As soon as a soul leaves a body (yeah, I know) the demons can take up residence, absorbing their memories and using what’s left of the flesh for their own means. Conscious zombies, actively working together to bring about the fall of mankind so that their cousins can finish the job and torch the planet entirely before moving on to the rest of God’s creation. It’s certainly an original conceit and while it takes time to find its feet, Keene soon has fun with the possibilities opened up to him. The Rising and City Of The Dead manage to weave the standard plotline together with the demonic zombies and come up with a pretty gripping tale, albeit a rather lightweight and pulpy one. The one thing which grated for me was the religiosity – souls, gods, etc – although to be fair it was not handled in a ham-fisted way. For every mention “God will get us through this” another innocent would die a gruesome, painful death only to return and attack his comrades. That aside, for any zombie fan looking to kill a few hours it’s well worth a read. Go into it expecting an enjoyable romp with some well-developed characters, originality and extreme violence and you won’t be disappointed.